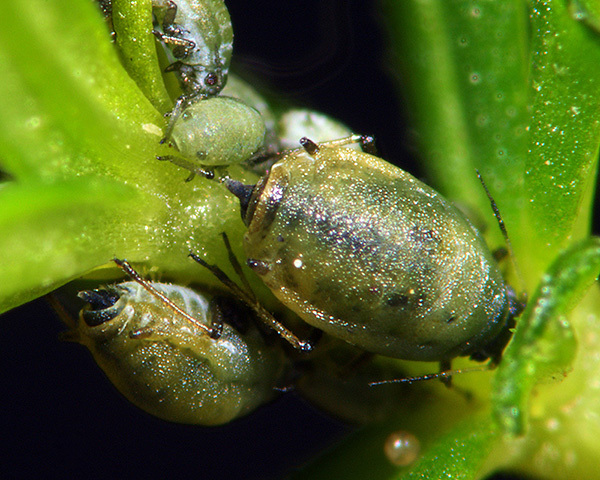 Staegeriella are rather small greyish-green oval aphids. They have very low divergent antennal tubercles. The antennae are much shorter than the body, with the terminal process about twice as long as the base of the last segment. Dorsal body hairs are very short. The dorsal body cuticle is membranous apart from dusky transverse bars on abdominal tergites VII and VIII. The siphunculi are truncate, shorter than the cauda, and less than twice as long as their basal widths. The cauda is tongue- or finger-shaped. Alatae have pale marginal sclerites and dorsal cross bands on the posterior tergites. There are only 1-2 species in the genus. Staegeriella necopinata is well known, but other possible species are so far unnamed. Staegeriella necopinata feeds on bedstraws (Galium species) and possibly Coprosma and/or woodruff (Asperula). 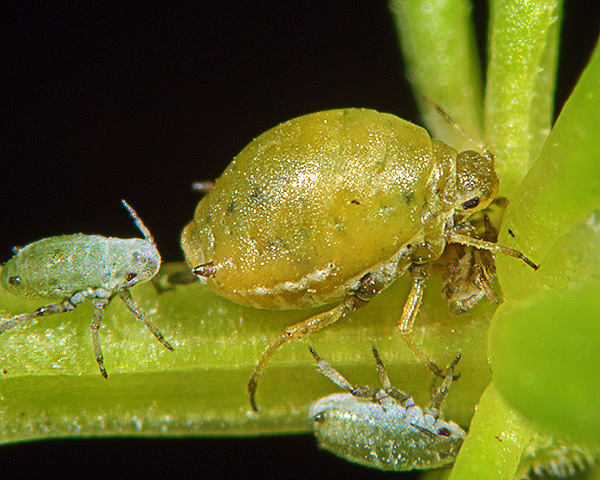 Adult apterae of Staegeriella necopinata are yellowish-green or greyish-green aphids (see two pictures below), powdered ventrally with grey wax. The grey siphunculi are short and truncate, have a small but distinct apical flange, and are distinctly constricted below that flange. The siphunculi are 0.5-0.8 times as long as the grey finger-shaped cauda. The body length of adult Staegeriella necopinata apterae is 1.3-2.2 mm. Immature Staegeriella necopinata are greenish with more or less extensive wax powdering especially intersegmentally. The alate has similar short truncate siphunculi, rather pale marginal sclerite and no abdominal patch. Staegeriella necopinata does not host alternate, but remains all year round on bedstraws, mainly yellow bedstraw (Galium verum). It feeds on the stem, growing shoot and flower. Oviparae and alate males occur in autumn, with overwintering in the egg stage. Staegeriella necopinata is found in throughout Europe, although it is rare in Britain.